Another chance to hear all 25 episodes of Allison Blaes’ Midnight Metal Hour. Warning: Content may be inappropriate for some listeners. 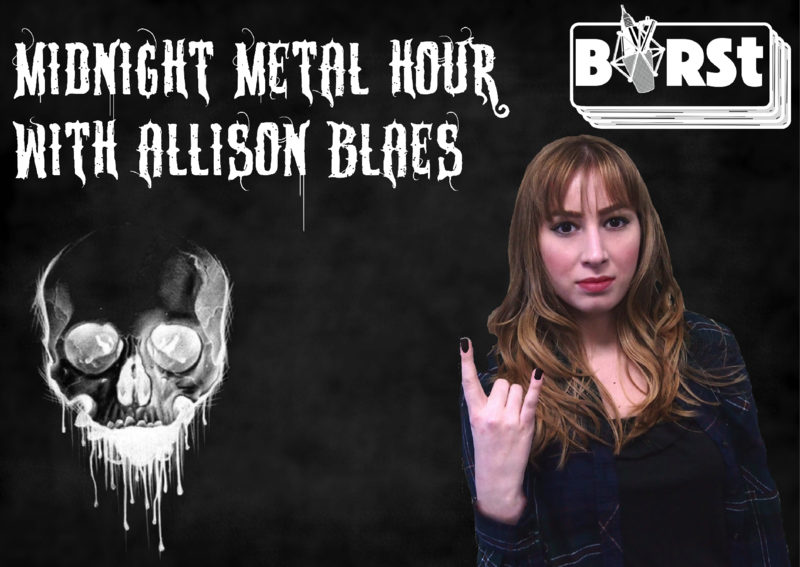 Tune in for the very first episode of Allison Blaes’ Midnight Metal Hour tonight at midnight. It’s a full hour of pure metal, where we delve into different genres of metal throughout the years. Plus, each week there is a metal ballad, a metal cover, and Allison’s pick. This week is purely an introduction of the show, and an introduction of Allison’s love for metal. This week has a very sad, emotional and gritty playlist. It’s a little on the heavy side, but with some great metal. As promised, this week is not as heavy and a little more punk. We look at different genres like Alt Metal. Plus, there are a few curve balls. Another jam-packed hour of pure metal, where we delve into different genres of metal throughout the years. Plus, each week there is a metal ballad, a metal cover, and Allison’s pick. On this episode of midnight metal we explore more genres, and some new bands. It’ll be great for getting ready for a night out, dancing on a night in, or for one more hour of fun before bed. As always it has three features looking at: the softer side of metal, Allison’s favourite track at the moment, and an excellent metal cover. On this episode of midnight metal we get in a good workout by dancing to the great metal tracks. As always it has three features looking at: the softer side of metal, Allison’s favourite track at the moment, and an excellent metal cover. Looking at the softer side of metal, Allison’s favourite metal track at the moment, plus we have the cover of all covers! If you listened to the Friday Meltdown you may know what it is. Also on this episode, we’re taking it back to basics because metal helps us feel acceptance and understands the tough situations life throws at us. We continue exploring metal including the likes of nu and rap metal. Plus, there may be a few surprises… What could they be? It’s the artist showcase episode of the Midnight Metal Hour, because we’ll be jamming to quite a few artists that are newbies to the show. As always, there will be three features: one for the softer side of metal (this week’s is particularly emotional), one for my pick, and a metal cover that will get you dancing. It’s a pretty fun episode of the Midnight Metal Hour, with lots to mosh and dance to. As always, we look at a range of artists within the metal genre. Plus, we have three features: one for a metal ballad, one for my pick (this one is a fun one for you and your mates), and one is a cover. This is the “Feels” episode, because it will make you feel all the feels that only metal can do. We explore lots of sub-genres, have a few throwbacks and some serious jams. As per usual there are three features: Rock Me Softly or the softer side of metal, Allison’s Approved Track or this week’s pick, and Under The Covers With Metal or a cover track. This week on the Midnight Metal Hour, we have a new disclaimer, a knockout playlist, and a surprise guest. Even if you’ve never tuned in, this is an episode you don’t want to miss. It still has the standard three features that make any Midnight Metal Hour of : Rock Me Softly (the softer side of metal), Allison’s Approved Track (my pick), and Under the Covers with Metal (a cover track). As its the 13th episode, and we’re due for something special… This week we’ll have the Girl Power Midnight Metal Hour. So, it will be a female-led playlist to honour all the chick rockers out there. Whether you’re one yourself, or you can just appreciate them, you won’t want to miss this show. The fun begins tonight at midnight. We’ll still have the three features showing off the softer side of metal, my pick, and a metal cover. You are now entering The May Metal Takeover! Each show for the next month we’ll have a special guest on (my dad), to pick a track for the Under the Covers feature. This time we’ll give him a choice of country tracks, a genre he knows and loves. His choices will be: Sam Hunt, Luke Bryan, Garth Brooks, or Florida-Georgia Line. To introduce this awesome month, we’ll have some classic rock vibes from the likes of Guns N’ Roses and more. Don’t worry, we’ve still got loads of new stuff… In fact this show is mostly new music (Yay). It’s Friday the 13th and we’er two week into the May Metal Takeover! Each show for the next month we’ll have a special guest on (my dad), to pick a track for the Under the Covers feature. This time we’ll give him a choice of classic rock tracks. We’ve reached the third week of the May Metal Takeover, and this time we ask my dad to choose between some 80s tracks. This is pretty much the new music playlist; so, it will be good to have a cover track from an 80s song to get a bit of diversity. As always, there are three features: Rock Me Softly, Allison Approved Track, and Under the Covers with Metal (where my dad takes over). Hear what my dad chooses, all the new music, and have some laughs. It’s the final May Metal Takeover episode. So along with the three features: Rock Me Softly, Allison Approved Track, and Under the Covers with Metal, we’ll be brining my dad on to pick a song for the cover. We close out with some classic rock choices. We’re back to normal on the Midnight Metal Hour, but we still have the regular three features of: Rock Me Softly (the softer side of metal), the Allison Approved Track (my pick), and Under the Covers with Metal (a cover track). Next week we’ll have Kieren Thomson hosting as I’ll be in Texas (well actually I already am in Texas). You will not want to miss it. Allison and Kieren this week have swapped shows. In this special takeover, Kieren scrapes the bottom of the barrel to find enjoyable metal from his early teen years. What remains? System of a Down (excellent), Bullet For My Valentime (dated) and Test Icicles (very arguably not metal). Allison is back in town, and ready to get back to the metal. Although if you missed either Allison’s Street Knowledge (Hip-Hop show) Takeover, or Kieren’s Midnight Metal Takeover, you will want to check them out. This time we gear up for festival season with a festival playlist. However, next time its back to normal. Plus, we’ll get Mummy Blaes on. t was supposed to be back to normal this week; but, in light of recent and ongoing events it’s time to share some love. So, this time there will be no real structure to the show; it will just be all about the love. No matter where you are in the world, what is going on there, or what you may be voting for, it’s time to come together and jam out to some metal. This time everything is back to normal, but it is still all about the love. This time it’s an all request show, with the three staple features of: Rock Me Softly, the Allison Approved Track, and Under The Covers With Metal. This week it’s back to normal with lots of new music, and some throwbacks. As always we’ll be playing all types of metal, and we’ll have the staple three features: Rock Me Softly (the softer side of metal), the Allison Approved Track, and Under the Covers with Metal. It’s been an eventful week as a whole, and here at BIRSt; so, all plans have been ditched. Tonight’s Midnight Metal Hour will be an “Emo” special to reminisce, and forget about today’s worries. We’ll still have some structure though with the three regular features. It’s the final day of our Master’s course here at Bournemouth University, and this year’s BIRSt team will be leaving soon. As celebration to our final hand-in, and our last few weeks at this station, we rock out with some metal. This week we have our regular three features, Mummy Blaes in, and some new music.